Installation of 17 x 225 kWp Schott poly panels divided 1/3 : 2/3 on two adjacent south facing roofs. The two strings/arrays terminate on an SMA SB 4000TL multiple power point(MPP) inverter. Two strings were used to maximise generation and the panels were positioned to avoid anticipated shading. The inverter shows all panels are producing electricity @ almost 100% of anticipated efficiency. We installed the PV system in the Autumn so we could learn to maximise our use of our "home grown" electricity during low sunshine time of the year to take full advantage of the free power in the summer. The most satisfying experience to date has been to watch the Electricity company's meter go backwards! I'm sure this will be eclipsed when we get our first cheque from the government for the energy we have generated. 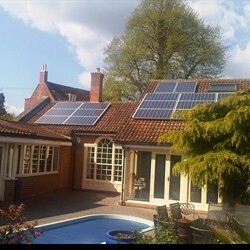 We bought our PV system from Solar Panels Cambs Ltd. www.solar-panels-cambs.co.uk; who were efficient clean & professional throughout.